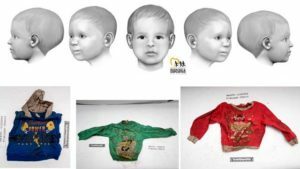 ‘Baby Doe’ Remains Found in 2004 in Rancho Bernardo: Know Tot’s Name? The child, dubbed Baby Doe by investigators, is thought to have been white and 2 to 4 years old at the time of his death, with light to medium-brown hair. Isotopic analysis of his remains suggest that he was born in the mainland United States around 1999 or 2000 and that his mother likely lived in the Southeast region of the county during part of her pregnancy. Baby Doe may have spent the first year or so of his life in that area, detectives believe. Anyone who might be able to help police determine who the boy was and how he died is asked to call San Diego County Crime Stoppers at (888) 580-8477. Tipsters may remain anonymous and could be eligible for a reward of up to $1,000.